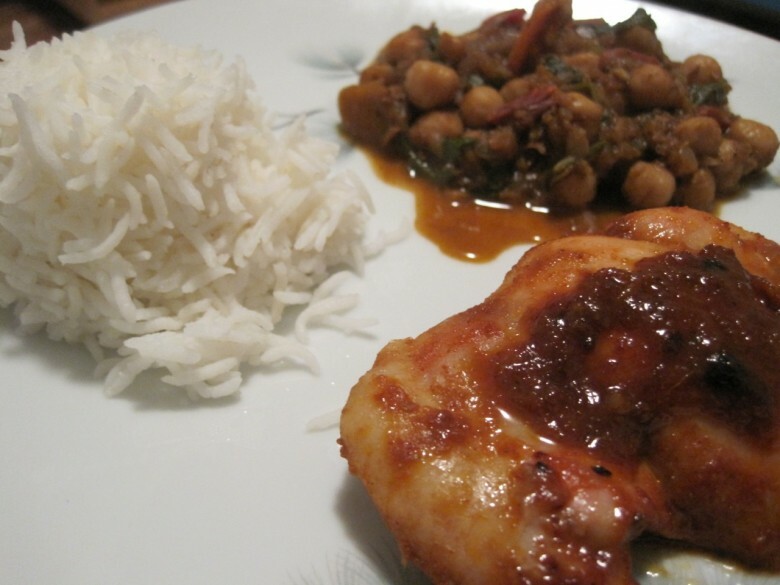 This meal has two intense flavor popping parts: chicken thighs with a harissa honey cumin bbq sauce and a chickpea (plus veggies) curry… and a little Basmati rice on the side to cool off the tongue. -the juice from 1/2 a lemon. Mix the above ingredients together in a bowl and marinate the chicken for as long as possible. Preheat oven to 375. I greased the bottom of a non-stick baking dish with a little Ghee before placing the marinated chicken in- to both prevent sticking and give it a nice flavoring. Bake the chicken according to thickness. I used boneless skinless chicken thighs and the cook time was between 20-30 minutes. Flip once in the middle of cooking and apply a spoonful of the remaining sauce to the chicken. To make the chickpea curry start by heating a tbsp of Ghee in a large deep-bottomed pan. Add the cumin seed and cook until the seeds begin to crack and pop. Add the chopped/blended onion mixture and stir frequently over medium heat being careful not to burn the onion mixture, you only want to sweat it for about 3 minutes. If it gets too dry add a tsp more Ghee. Next add in the chickpeas (carrots and spinach if you choose to go for the extra veggie pop, like I did. I had to use the spinach before it yellowed and I always like added veggies!! ), the chopped tomatoes and their juices, and all the powered spices. Mix well, bring to a boil, then reduce heat to medium-low and simmer for at least 15 minutes. The longer you cook the more the flavors marry and better the sauce gets. Feel free to add water to the sauce in 1/4 cup increments should you cook the curry for a longer period of time. Add the lime juice right before serving. As a side note: A month or so ago I took this awesome class for $15 at the Brooklyn Brainery called How To Be an Indian Vegetarian (in New York), taught by Avni, where I learned how to make a couple chuteneys, panir, a curry… amongst other goodies!! This chickpea recipe is a spin-off of of what I learned. Before this class I never would have used red onion in my curry, nor would I have processed it in the blender. I also discovered interesting spices like ground pomegranate seed, mango powder and chat masala. If you’re a New Yorker be sure to stop by Kalustyan’s at 123 Lexington Ave, for a myriad of obscure Indian and Middle Eastern spices and ingredients. Yum!! 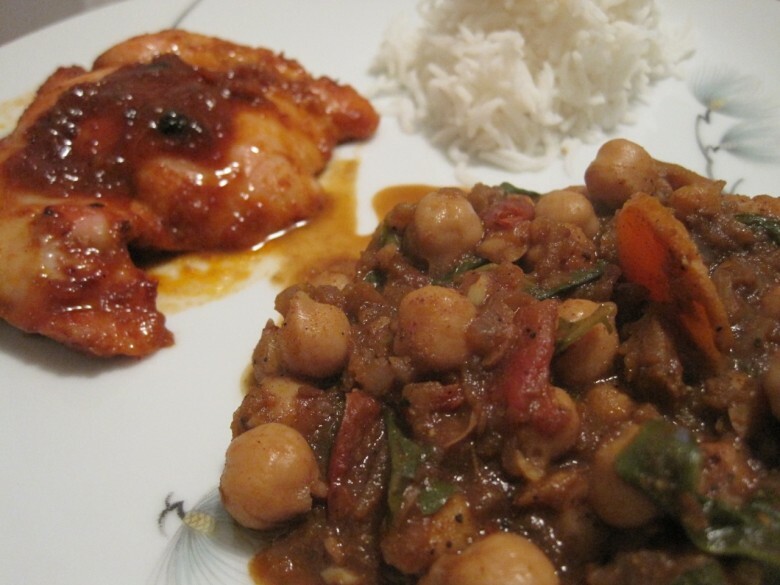 May 21, 2011 | Filed under dinner and tagged with brooklyn brainery, carrots, chicken, chickpea, curry, dinner, heirloom tomato, indian, kalustyan's, mushrooms. Whenever i am hearing about chicken, A water spilling from my mouth.. What a delicious recipe you have shown here,,!! Hope my mother make it tonight.